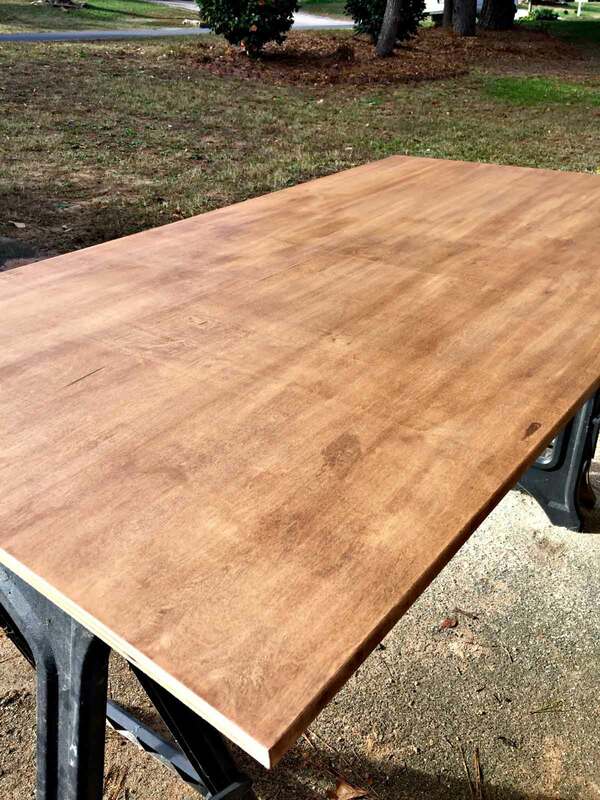 This DIY wood countertop project was inexpensive and able to complete with one person for installation. 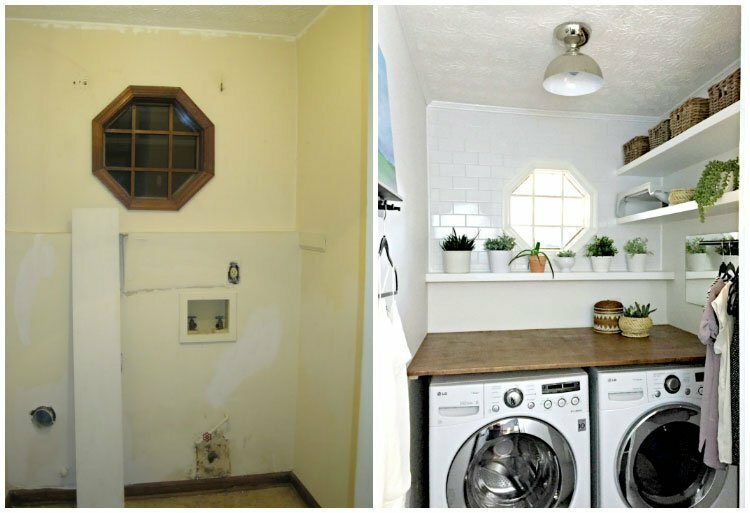 See how it transformed this laundry room overnight! 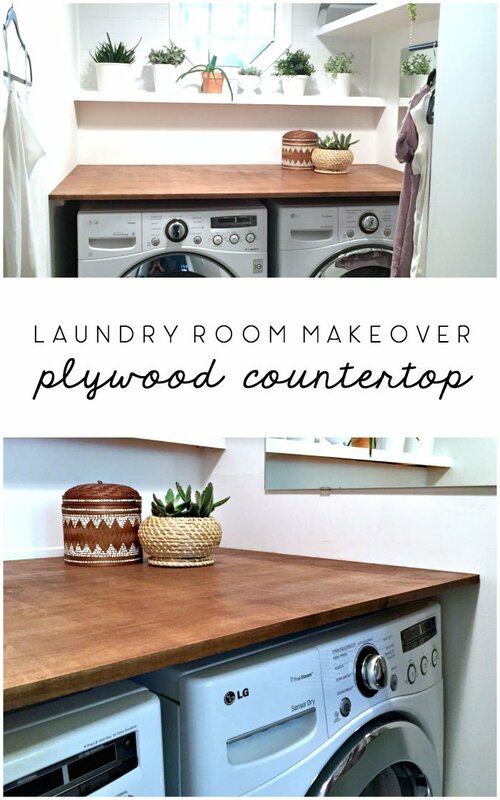 I’ve gotten a few questions so far on last week’s big laundry room makeover reveal, and to no surprise, many of them were about the DIY wood countertop. So, I figured the first post I would put up this week should include some answers! The laundry room’s wooden countertop is made from 3/4″ maple plywood. It’s pretty heavy, so I had a beast of a time getting it to fit on my walls, which were also wonky as hell (the back corners were just slightly wider than the width of the wall where the front of the washer and dryer are… oh, the joys of working on an old house!) :) Remember: measure twice, cut once, and hammer to fit. In my case, I also used an electric hand planer to knock off 1/16″ widths at a time until things weren’t getting stuck on the drywall anymore. 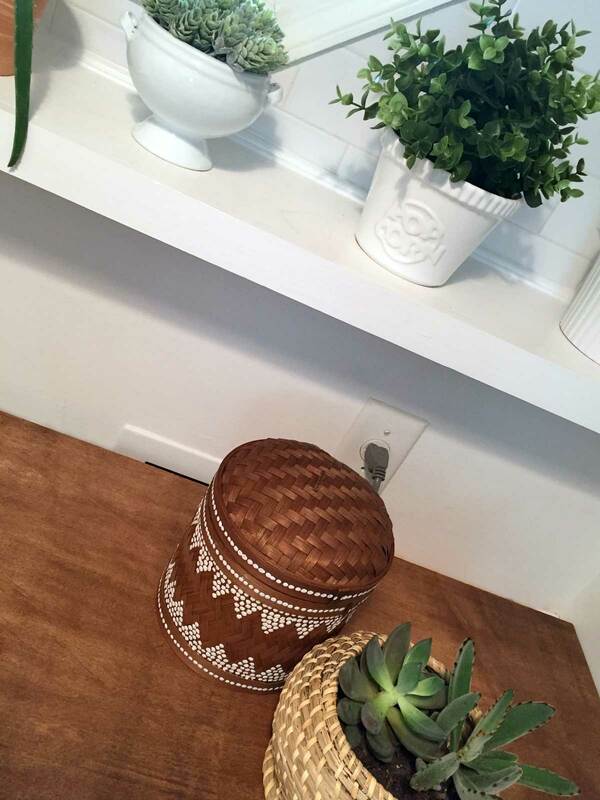 Before installing, I did a little research and spied that Mandi from Vintage Revivals uses a nifty trick to save on the cost of a thick piece of plywood by gluing a more expensive one underneath, and I love that idea! If I’d had more time than an extended weekend to finish mine (I was under a pre-Christmas deadline), I might have tried this same trick, too; I think it would have made the plywood counter even stronger and less likely to bend under any weight (it’s not doing that now either, but in time with use, that could be something I go back and try to reinforce even more). Perhaps if/when I upgrade the front piece of the counter to look more substantial (even though the supports are offset from the edge of the counter by a few inches, you can still see some of the support along the wall, which could be hidden with a longer decorative piece of lumber attached to the front), I’ll see about adding another piece underneath. The plywood is actually just wedged into place and doesn’t move, so I can easily take it back out again if I needed to with a few swings from a mallet. I bought a full sheet of plywood, but I took my measurements to Home Depot before the purchase and asked them to cut it for me (which they’ll do for free unless you have a lot of cuts to make… I only had 2, and they also loaded the pieces for me into my SUV). 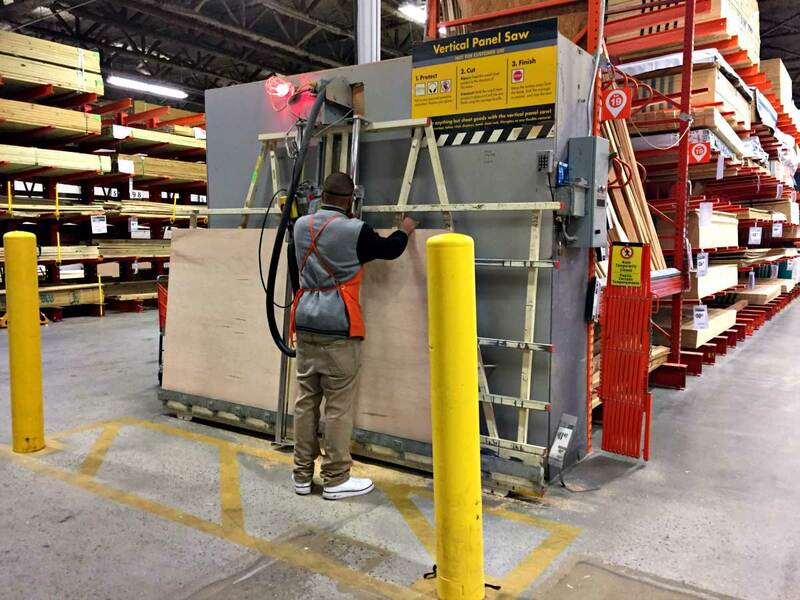 Tip: When having a big box store cut the wood for you, it’s important to inspect the full sheet of plywood and make your cuts strategically so that you can get as smooth of a cut as possible and wind up with the section of the plywood you like the most. Their saws can handle the cut with ease, but there’s a lack of control and speed that you’ll have as a customer (compared to, say, cutting it yourself with saws you’re more familiar with using at home) and it’s good to be observant when they’re cutting things down. When the saw was cutting with the grain (along the length of the plywood), the wood had very little splintering. This was important, since this would be the cut along along the front edge, where it meets the front of the washer and dryer (as in, the most noticeable front lip of the countertop once installed). But on the pass for the crosscut (when you cut the wood perpendicular to the wood grain), I was worried that it would splinter a lot. Even though these edges would be on the left and right side walls in the laundry room (so, not as noticeable as along the front edge), the concern was that these areas would not take stain as evenly if I had to patch it up with wood filler (even when it’s a stainable filler, the texture looks different, and I wanted to prevent/minimize the obvious parts that were patched). Using the first cut as a guide, the clerk and I both noticed that the wood splintered slightly more on the front of the cut than the back on the saw. So, I used that as a way to plan which side of the plywood would be the top and bottom so I could hide the splintered side underneath. As far as installation goes, I treated the countertop similar to how I installed the floating shelves on the right side: as one large shelf in need of support along three sides. However, given the narrow space, the room’s dimensions were a little tricky to work around. For one, everything I did along the back wall had to be done around the washer and dryer; moving them out of the room through the hallway and into the kitchen would result in both units getting off balance (it’s important to keep them from knocking around), so I made the choice to keep them in the room and simply climb over them to install the supports along the three surrounding walls. The supports were created mostly out of some inexpensive 2x2s (be sure to inspect them carefully at the store for warping). I would have used 2x4s, but the height of the lumber would have created a huge gap between the counter and washer and dryer, and I didn’t want that much clearance on top (while you do want to leave some space for air flow around the units, I wanted things to still look like a more snug fit). Measurements of the room are far from square, so it was a lot of trial and error to get things level. It helps in these situations to mark everything down on the wood itself so you know which end is up, where the studs are, etc. Given that the room is also surrounded by the garage on the left, an exterior wall with masonry along the back, and a closet and bathroom along the right, I was very careful to use a stud finder and heavy duty drywall anchors to put each support in place. Figuring out how to support the middle between the washer and dryer was a little tougher; with the entire length a little less than 5 feet wide, I was reluctant to try to build support from the floor (I already had so little wiggle room to move the washer and dryer around, any structure in the middle would have been very snug!). So, I settled on a heavy duty shelf bracket — the largest I could find in store boasted a 600-lb weight capacity — by attaching it to the back wall. As for the stain color, I pretreated the wood with wood conditioner for an even coat and then used a couple of coats of ZAR in Modern Walnut along with a few topcoats of poly to seal. To hide the plywood layers along the front lip of the counter, I again used 3/4″ iron-on veneer edging like I did with my entryway closet. Again, since I can see some of the supports still, I’ll probably cover this over at a later date with a stained piece of wood instead. To my surprise, it didn’t take much effort to get the plywood level (pictured is my 4-foot level that I inherited from my grandfather). Phew. Once in place, I tested it out a couple of times, and it’s very sturdy. While I don’t think it would be wise to stand on top of the counter itself and put my full weight on it, I planned for it to handle at least two full laundry baskets full (though the hope would be not to leave things in the laundry room anymore!). Estimates online said a full laundry basket could be around 18 pounds, so I planned for 40 but still made sure that the anchors I used in the wall could handle twice that amount. 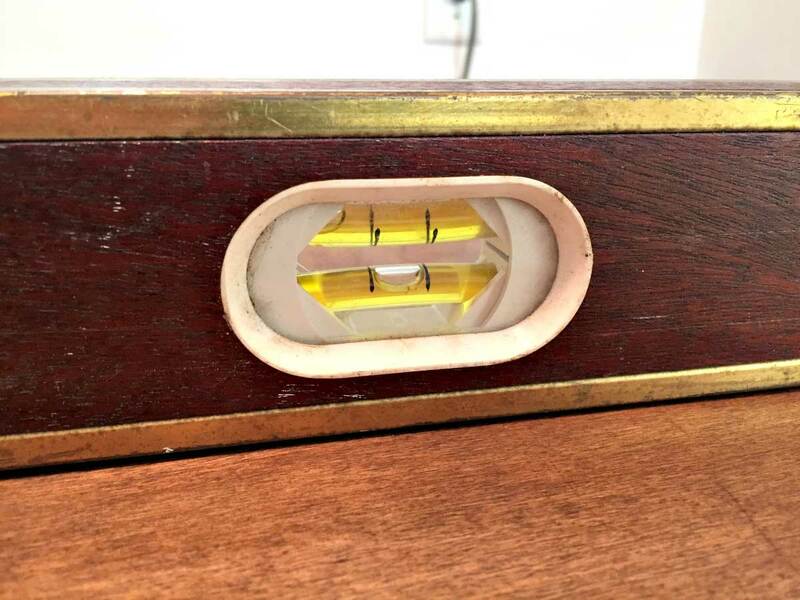 The depth of the counter still had a small gap in the back to allow for the cord for the washer. There you have it! More details about other features in the laundry room makeover, along with more DIY projects, coming your way shortly! I like the look. Good, simple (somewhat) project to do. I’m thinking about unstacking ours and doing something similar. I just don’t have two side walls o support, I’ll have to come up with some kind of support leg or brace for the floating end. PS – I really like that level. Reminds me of one my Dad had. 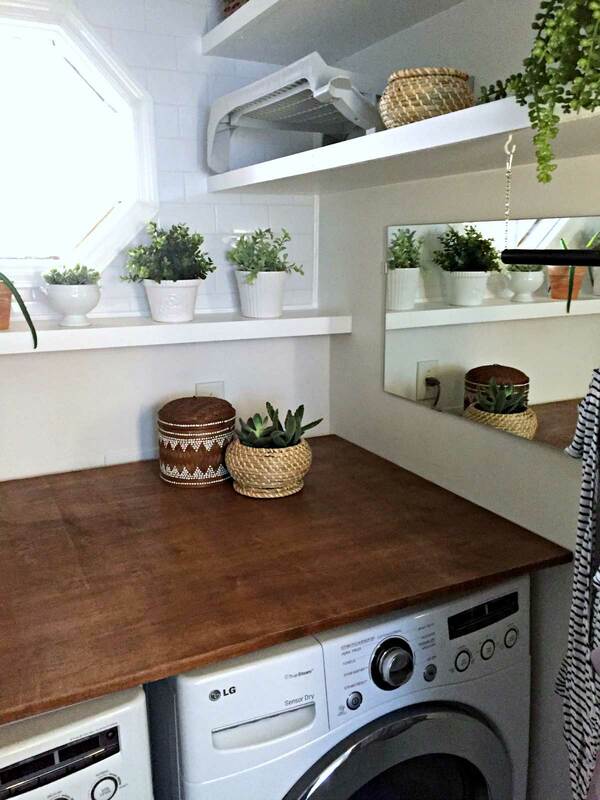 I love how you styled this laundry room! Keep it up! Hey Sarah! I love your laundry room. I am thinking I may use plywood for a kitchen island top. Like you, we use cutting boards and wouldn’t be putting any food directly on the wood. I will have to edge all the way around though because it’s an island…. I think it could work, your thoughts? Hey Leen! So glad to see a familiar face on my comment thread too! I think as long as you get high-quality plywood, that could look really cool (and even the edge could actually look really neat if you left the plywood edges exposed. Or you could also add edging with a piece of wood instead of veneer (the veneer in a high-traffic area like a kitchen island would probably peel in conventional DIY applications unless it was epoxy’d on or something, right?). I would take a cue from Vintage Revivals though and maybe glue down a cheaper plywood beneath to beef it up a little. Can’t wait to see your results! 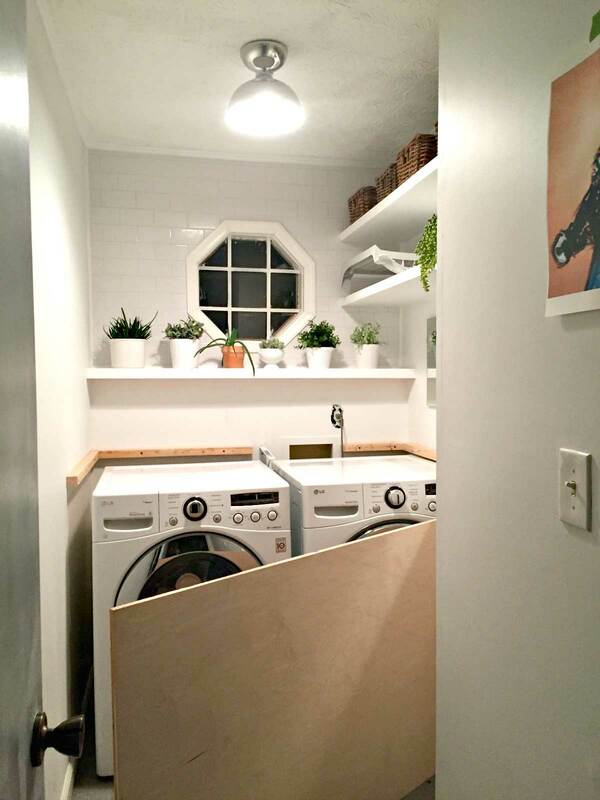 This is an awesome idea and when I saw your post I knew this would be the most cost effective solution for our laundry room after we were quoted nearly $680 for a laminate installation from a big box store. Unfortunately our walls weren’t square either (in a new home no less) and my husband had to make a crooked cut for a tight fit and the ends splintered a fair amount. Would love any user suggestions on how to fix or hide it. I thought perhaps a trim around along the wall but didn’t want anything big like a quarter round. I’ll try to do a post just for this issue, Tammy! I’ll include up-close pics of mine so you can see how it looks, as well as preventative tips (in case you decide to scrap the counter you made and do a new one… which is still less costly than the $680 counter, or for anyone reading this who shares your same issue). Stainable wood filler would be my first recommendation, and shy of that, you might want to do a more low-profile decorative trim around the outside (not quarter round, which is kinda fat, but maybe something like stainable wood trim like you’d use for furniture pieces). Also, question: If you were to go back and do the stacked version like Mandi, which plywood product would you get from Home Depot? By which plywood product, what do you mean? 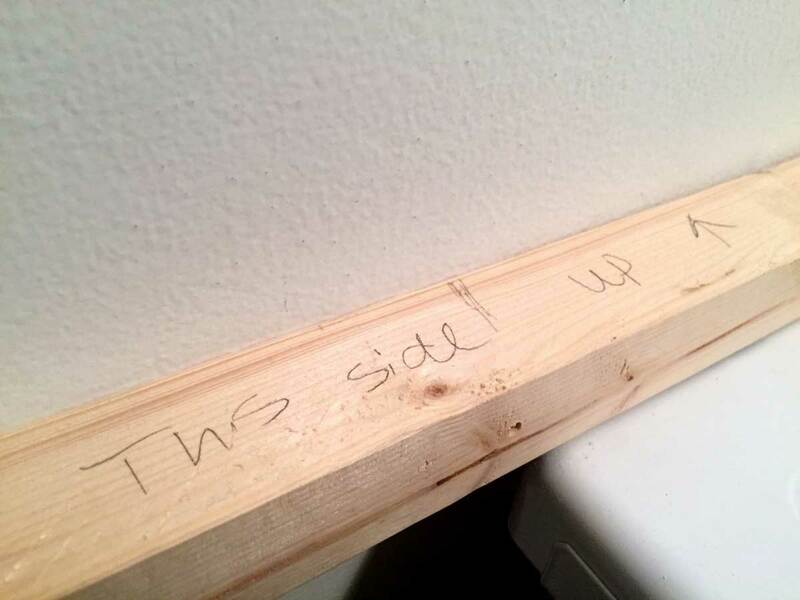 I buy plywood from both Home Depot and from Lowes and buy the 3/4″ width (it’s VERY sturdy). The main difference in results with plywood is what the top layer is (such as if it’s oak or birch or whatever … they will have different stain results). Good luck on your project! Did you fasten the top down to anything or is it just sitting on top of the framing? For now, it’s just sitting on top. That’s so I can still remove it (the hose connection for the front of the house is on the exterior wall right behind the counter, so I still need access in case I need to shut off the valve). There is enough support and it’s nice and snug so it’s not going anywhere, even without fasteners to hold it in place.